Also Recommended: Rurouni Kenshin, Samurai X. Notes: Based on manga by Nanae Chrono. Young Tetsu's life is torn asunder when his parents are brutally murdered one night. Now, blinded with a thirst for revenge, Tetsu decides to join the Shinsengumi, an elite group of swordsmen sworn to protect the capital. The Shinsengumi are engaged in a brutal conflict with the Choshu rebels, the same ruthless killers who murdered Tetsu's parents. 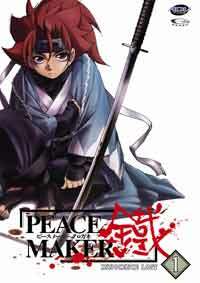 In the name of justice - and against the will of his older brother - Tetsu desperately hopes to join the Shinsengumi. Peacemaker is a pseudo-historical samurai anime meant for, I assume, a younger audience still new to the hobby, and naive to other previously-released, higher-quality titles out there, such as Trigun. Now, the reason that I assume this is simply because if you've seen Trigun, or any others of its ilk, then the plot premise ("I can't kill," "be a peacemaker," etc.) and twists are all very familiar to you, and to put it simply, you've seen them in a better quality series. Sure, there are differences between the two, such as the "authentic" representation of shogunate-era Japan, the "cute" adolescent main character, and the cleaner, more modern look of Peacemaker's animation. When it all boils down to it though, I can't honestly recommend this anime when I know for a fact that there's much better titles out there that handle the exact same subject matter, and done it with far greater quality. Heck, every single aspect of this series, hooks and catches included, has been done before by many other titles, and in all of them done better than they were done here. For example, the first hook: The Young, Middle-/Highschool-age hero that provides an identifiable reference point for the audience? Take a look at the first season/story arc of Naruto and you'll find that the hero is almost an exact clone, only Naruto's comedy is actually funny. As a matter of fact, the hero's character sums up the feelings that I have for the whole series Peacemaker's hero is decent and engaging while the drama of the series is paramount, but as for the comedy sections? Peacemaker's hero (and the series in general) comes off as annoying, forced, and lame, yes...lame. You could also be saying though "I'd still rather watch a samurai-themed anime than a western, or any of those other types." And you'd be very welcome to feel that way. I'd still recommend other titles first, such as Rurouni Kenshin. Maybe this is where I'm missing something, because as far as I can tell, the fans of this series are also fans of Samurai X/Rurouni Kenshin and tout it as the "next step." Then there's the people who can't stand to watch anything with a straight, concise plot thread, they need gut-busting comedy and heart-wrenching drama in the same series, and they need it in exactly equal proportions. Fine, so be it. Yes, this series will fulfill your need, but so will other titles, with higher quality of both. Peacemaker's dramatic episodes were well-paced and passable, but inconsistent, and interrupted by comedy that just seemed so forced and out of place; I would find myself daydreaming while I should have been watching and being entertained. Don't get me wrong though, there were various pieces of this anime that I liked. The music was actually really good, aggressive J-rock that fit very well with the series, it was possibly the one thing that they did to excellence. Heck, I could even listen to it on a regular basis, if I understood Japanese that is. I also mostly enjoyed the side-story of the spy/ninjas for the Shogunate and Ronin factions. The characters (for being side-story characters) were very well fleshed-out, and would have added a full-out star all on their own if they had had any sort of closure. As it was though, for a small spoiler, they were left hanging, and I was left a little pissed off. For the animation, I'd give it a fair to good rating. The action is pretty well done, while the comedic half is done in a very typical kid-style, something like the animation Gainax uses for the comedic portions of His and Her Circumstances. Nothing to write home about, but very suitable and appropriate. It does make me sad to see a studio like Gonzo (who did one of my top five favorite titles ever: Vandread) put out such a mediocre effort. Recommended Audience: Violence, some implied torture, and bad comedy. Not for the too younger crowd, but teens and up should be ok here, especially because they actually take the character death seriously.